Since his elevation to Red Bull in 2014, Daniel Ricciardo has cemented himself as one of Formula One's most exciting talents. He has established a reputation for brilliant one-lap speed, thrilling overtaking and a competitive spirit that has helped him claim some of the most exhilarating race victories in the sport's recent history. The self-styled `Honey Badger' has done it all with a smile, displaying the infectious personality that has made him one of the most popular drivers on the grid. 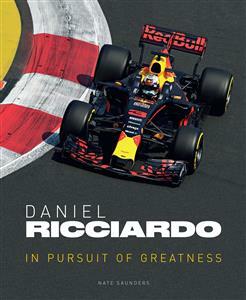 Starting with Ricciardo's rise in Formula One, this book gives a race-by-race account of the highs, the lows, the controversies and the triumphs. Featuring 150 dynamic colour photographs that take you to the very centre of the action, this is a brilliant insight into the excitement and drama of Formula One, and one of its most popular superstars.